All the data of the faithful must be filed, no external lights in places of worship, minors banned from entering church and the obligation to sing the Chinese anthem at every celebration. Every Sunday the police guards the entrances of the churches. 10% of Chinese Catholics live in Henan Province. The repression and control of Catholics in China increased this year. Beijing (AsiaNews) - The Chinese government is approving increasingly restrictive measures against Catholics in the central province of Henan. As Eglises d'Asie reports, five new rules have been imposed which include the requirement of religious working in the province to collect data and information on their faithful. A priest from the diocese of Zhengzhou reports he has received the order to register and declare the number of faithful and their respective socio-economic conditions. According to the religious, this "census" could be "dangerous for the poorest families". In fact, another consecrated person of the same province claims to have received the municipal authority's order to collect data on the composition of the community, especially those of poor families. "It is totally irresponsible. This maneuver hides an undisclosed intention to prohibit access to public subsidies to low-income people practicing Catholicism ", reports the priest, who wishes to remain anonymous for fear of reprisals. The Pew Institute figures indicate that today there are ten million Catholics in China, 10% of which are concentrated in the Henan province. "Now we just have to wait for the inspection. We'll see what they say before deciding what to do" adds a priest from the diocese of Luoyang. He is concerned about what the authorities intend to do with the data collected. The government states that the new regulation is intended to improve the way churches and other religious sites are managed. The priest believes that it is more a pretext to limit and repress religious activity in the province. He explains that the authorities visited his church on July 1 and gave him a circular entitled "Special Emergency Notice". The notice contains five points. In particular, it requires priests to register and declare the number and situation of the faithful. The priests were also asked to report to the local authorities any minors entering the religious buildings, as well as any neon lights or enclosures in places of worship. Another point states that the list of members of the clergy must also be posted in the parishes so that the authorities can verify who has permission to preach. A third point says that the Chinese flag must always be displayed in all places of worship and that the national anthem must be sung during each celebration. The last two directives concern the new rules on religious affairs and statistics to improve municipal registers. The members of the "special project" office must make unannounced visits to the churches of the province, whenever they deem it necessary, to ensure compliance with the new rules. This year, efforts to suppress religion in the province have intensified. Since the Chinese New Year, in mid-February, Catholics report they were banned from displaying traditional poems on their doorsteps (these verses, written in black and gold on red paper, are displayed at the doors of houses for the New Year and often Catholics use verses from the Gospel). Furthermore, kindergartens and churches were closed. 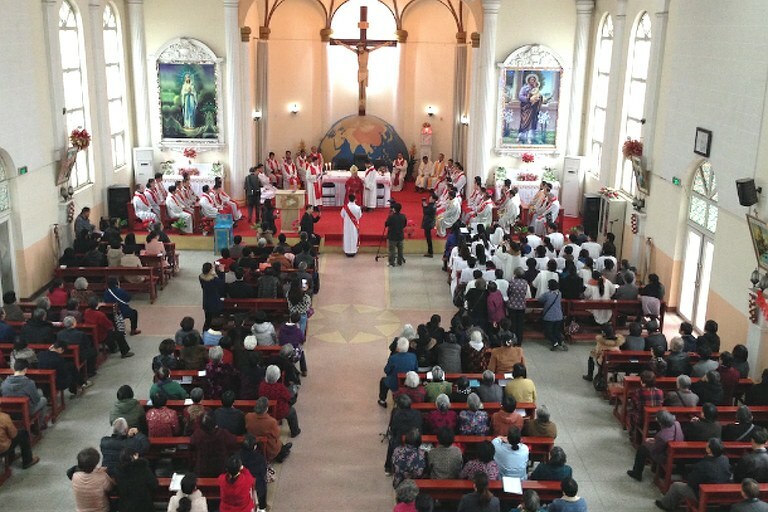 On April 24, authorities in Diandian City, Shangcai County, sent two officers to seal the entrance of the Gadazhang Catholic Church in the diocese of Zhumadian. One source reported that the closure was part of a new measure of the Communist Party. Following the approval of the new rules on religious affairs on February 1, minors have been denied access to places of worship. Since then, every Sunday, police cars guard the entry of churches. The authorities of Henan also destroyed the tombstone of Bishop Li Hongye, who had been appointed by the Vatican, but was not recognized by the government.